On April 24, Zhou Shengxian, Minister of SEPA met with Mr. Alfred Bobson Sesay, Minister of Lands, Housing, Country Planning and the Environment of the Republic of Sierra Leone and his retinue in Beijing. Both sides discussed some matters related to environmental cooperation. 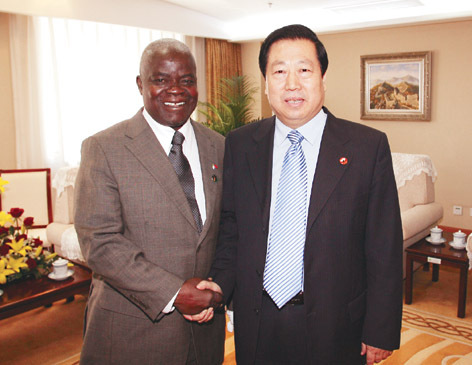 On April 24, Zhou Shengxian, Minister of SEPA met with Mr. Alfred Bobson Sesay, the visiting Minister of Lands, Housing, Country Planning and the Environment of the Republic of Sierra Leone and his retinue in Beijing. China has always given due attention to the cooperation with African countries, according to Mr. Zhou. China and Sierra Leone share the concerns and interests in the environment field, and both sides should be honest and cooperative, and share the experience in coordinating the relation between economic growth and environmental protection and in developing green measures, so as to contribute to the settlement of world environmental problems. Minister Zhou first introduced the progress made in the country's environmental protection, saying that in China's efforts towards industrialization and urbanization, the environmental problems increasingly become the sensitive issues that affect the public health and social stability. According to national conditions and the new environmental situation, the government adjusts its guideline for the environmental protection work, proposing from the strategic level to achieve the historical transformations. Currently, efforts are being undertaken in an all-round way to take the pollution control as the first priority and the safeguarding of drinking water safety as the top task. Meanwhile, according to the Kyoto Protocol and related international conventions, the government proposes in the 11th Five-Year Plan to cut down the energy consumption per unit GDP by 20% and the emissions of major pollutants by 10%. The government also allocates the targets to governments at all levels and relevant sectors. This move is important for the country to control the pollution at home and to address climate change in the world. It also reflects the country's courage and resolve to shoulder the environmental responsibility. Both of the countries are developing economies, they face the common challenges in coordinating the relationship between economic growth and environmental protection, and they have great potentials of cooperation in the environment field, said Minister Zhou. In actively promoting the historical transformations, China hoped to have in-depth discussions and close cooperation with Sierra Leone on environmental protection, in order to explore a new mechanism for environmental protection. Mr. Sesay said the attention to and strong measures for environmental protection in China deserved the study of his country. He hoped both sides would extend the exchange of talents and share the experience on soil pollution treatment, protection of mineral resources and environmental education, in a bid to promote the development of environmental cause in the two countries.